A day after returning from Hyderabad, I was still just thinking of when I should return home from Bangalore. I planned to stay on for another week in Bangalore. I sat down wondering which bus I should take to head home, and made some plans. Towards the noon on March 27, 2012, I get a call from Cochin asking me to be there the next evening! All the plans that I had made collapsed in no time. The first thing I did was to check for tickets that evening to Thrissur – thankfully, all operators had enough seats on every bus. 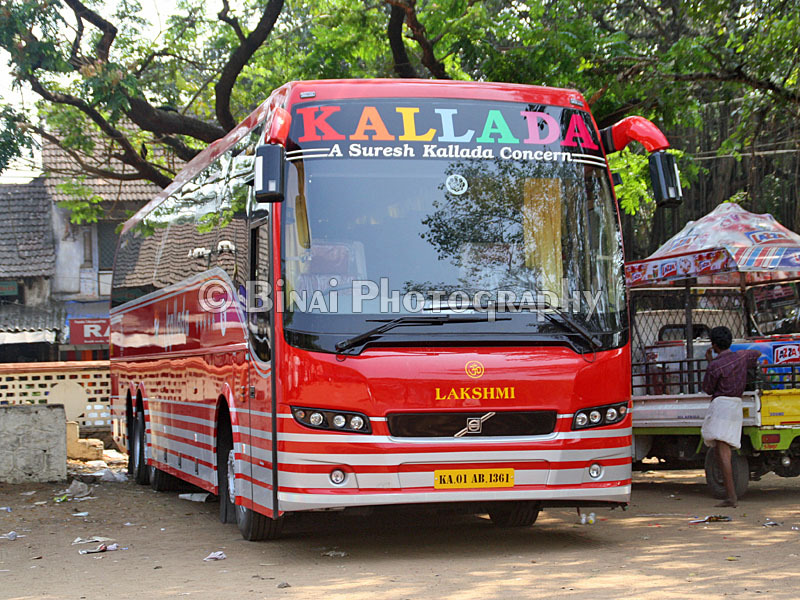 I finalised Kallada’s new Kodungallur B9R service – but for some reason, my booking wasn’t going through. I made a booking at their office in Madiwala – I was allotted seat #E1 (a Right side window seat). 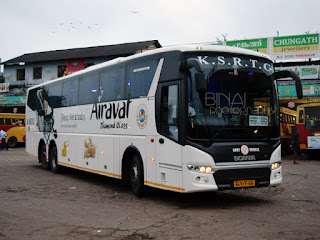 My bus was to depart only at 2230hrs from Madiwala – that gave me a lot of time at home. I had my dinner from home, and I was dropped at Madiwala by my brother at 2215hrs. Headed straight to the Kallada office and reported – he tore of a portion of the ticket and made a remark on the remaining piece: “1361 / 10:30pm”. This meant that the bus that night would be “1361” (KA-01-AB-1361), and that would come at 10:30pm. The bus came in at 2232hrs (10:32 pm) – it was the red bus from the new lot, with the “Volvo 10 Years” logo on the sides. I got into the bus soon after it came in. We were having a fairly decent load factor that day – about 50% seats sold, that too on a working day! The bus: KA-01-AB-1361. A new bus, with just about 22000kms on the odo. We finally started from Madiwala at 2255hrs with around 25 passengers on board. I did not have a co-passenger – two seats at my disposal. The driver had to try a bit of heroics to take a U-Turn at the St.John’s signal – thanks to heavy traffic on the road even at that time! The bus took the Elevated highway and continued its run towards Hosur. The run until the border was eventless – just zipping through at three digit speeds wherever possible. There was one really horrible traffic jam after the border – our driver just changed over to the wrong lane and kept going.. seeing our bus, a lot more guys joined in. The snarl was very long – more than a km long. We stopped short of Hosur flyover at an agency to pick up a passenger, and again near the bus station to pick up another passenger. We left Hosur at 2344 after all the pickups. The first driver was real fast – he just kept zipping through the traffic. For some reason, the traffic was really heavy on the highway. The heavy traffic continued all the way to Krishnagiri. Our driver, however, continued overtaking buses at a steady pace. In the meantime, there was some confusion inside the bus – a girl was searching for something under her seat. Soon her friends joined in, and the neighbours were woken up. They too were searching. Seeing all this, the second driver and the attendant came to the scene. She had lost her phone in the bus, and the phone was in silent mode. The attendant brought a flashlight and search under the seats – he quickly understood where the phone would be. He discovered the phone lying between the seat and the side wall. By the time the confusion was solved, we were on the Krishnagiri flyover. I slept soon after we crossed Krishnagiri flyover. I slept through for most of the distance since then. I woke up just as the bus pulled into the usual fuel station at Perundurai at 0318. They did not refuel, but just stopped the bus for a tea break. We left from Perundurai at 0327. The second driver took charge now – this guy was even faster. But the top speed we did was 105kmph (according to my gps). I was awake till we reached Avinashi – we turned right from Avinashi, and traveled via Annur instead of going via the highway. 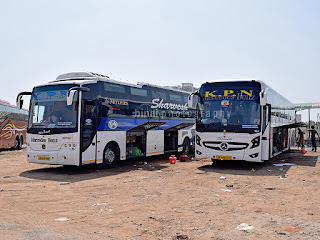 Most Coimbatore bound buses use this diversion – perhaps to connect more areas of Coimbatore, and also to avoid the awful section of road between Avinashi and Neelambur (Coimbatore bypass). 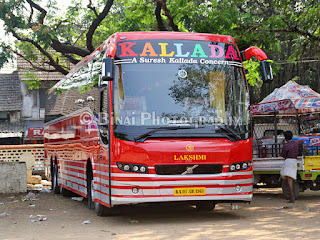 Our bus has a drop in Coimbatore – the only Kallada bus from Bangalore (except the day buses) to have a drop in Coimbatore. The bus stopped outside the SETC bus station in Coimbatore at 0443. A lot of passengers got off here – there were just around 10 passengers as we started off from here at 0446. One more passenger was dropped at Ukkadam. I slept after Ukkadam, and woke up when the bus stopped at Palakkad to drop a passenger (0545). The attendant was actually going to the passenger and waking up only the passenger who had to get down – but they did switch on all the interior lights. I slept again after Palakkad. I woke up just as the bus hit a bad patch after Kuthiran – we were nearing Thrissur now. Had another short nap and woke up just as the bus was about to stop at Kallada’s office in Thrissur (0704hrs). 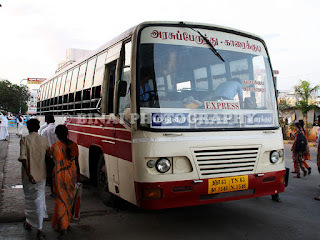 Their Chennai-EKM bus was also waiting there. They unloaded some parcels here, while the crew went to the office. More passengers got off here, and only three of us were remaining in the bus now. Our crew was now busy talking to the crew of the Chennai bus. The Chennai bus left first, followed by our bus at 0716hrs. The driver was very cautious after Thrissur – it is a typical Kerala highway – lots of curves and narrows at places. He did not exceed 80kmph most of the time, and was very cautious while overtaking. Our bus went into Irinjalakkuda town, to the Administrative office of Kallada. A lot blankets were unloaded here, and they settled cash at the office. After this, the bus headed to the booking office in Irinjalakuda – where the crew took a long tea break. We finally left Irinjalakkuda at 0758. Now there were two passengers in the bus – myself and a lady. The lady was dropped a few kms ahead. I was the lone passenger for the last 10km of the bus. One of the two drivers also got off at Irinjalakkuda. I was finally dropped right outside my home, at 0815hrs. Kodungallur (the last stop of the bus) was still 3.5kms away. The bus went away empty – with just the driver and the cleaner on board!! The seats: The leather/pseudo-leather upholstery was really comfortable. The bus was very new – just about 22000kms on the odo. The bus was serviced just the previous day – the interiors were just fresh. 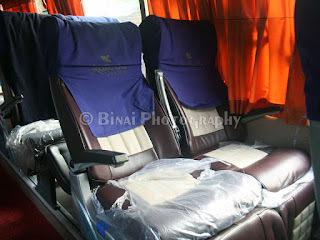 The seat covers were made of leather (or leather like material) and not the fabric that we see normally in Volvo buses. This kind of seat had better comfort, and it gets less dirty. The headrests had the usual cloth covers. Most seats still had the plastic covers on. The interiors were clean. 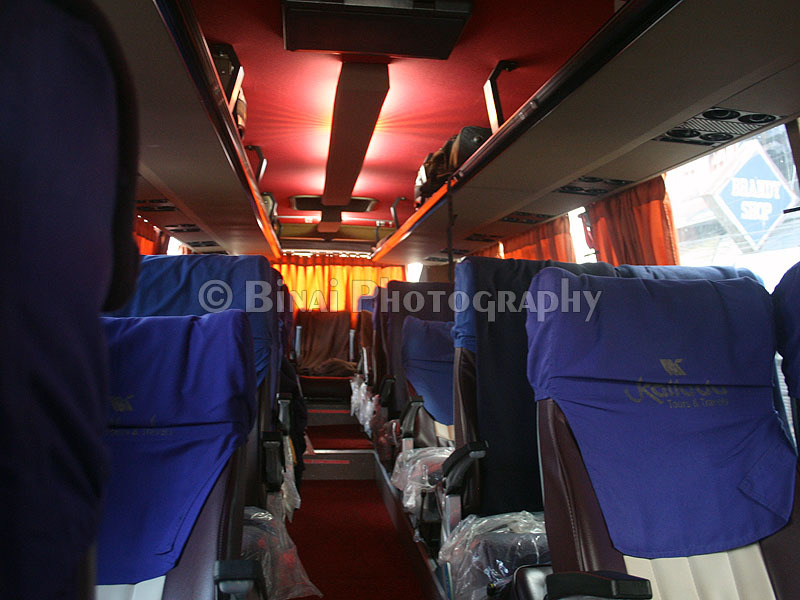 Like in every Kallada bus, the interior colour combination was in sync with the exterior colour – I love Kallada’s buses for this fact. Since the bus left past 10 in the night (2255), they did not play any movie. They did play some music for about 10-15 minutes. The crews were well-behaved – they stopped right outside my house to drop me. The crew did waste a lot of time from Thrissur onwards – we reached Thrissur just past 0700hrs, but we reached my place only at 0815 (the bus would have reached Kodungallur about 5-8 minutes later). Regular trip buses finish that distance in a shade over an hour, despite umpteen stops. The tea break at Irinjalakuda was needless – the bus was terminating just 15kms later. Ratings: Cleanliness: 5/5. Punctuality 3.5/5. Staff Behaviour: 5/5. Overall: 4.5/5. I have got a fair idea on Kallada reading your blog. I was not sure of this operator but now I would try out this operator next time. Nice review and photographs tells about the quality of the bus. Nice review.